Louis Macouillard may no longer be a famed name in the art world, but his charming tile mural on El Camino Real is a San Mateo highlight. Created in 1963, it adorns a modern bank building at El Camino and Third Avenue designed by the firms of Miller & Steiner and Wurster, Bernardi & Emmons. The ensemble exemplifies one tendency of mid-century modern architecture that too often goes little noticed – the incorporation of artwork, and often artwork of a popular nature, into a style of architecture better known for eschewing ornament. These are artful works indeed, with a delightful push-pull between the mural’s storytelling and its abstract play of shaped mosaic shards. But it’s childlike too, like illustrations in mid-century children’s books, like the work of such contemporary designers as Mary Blair or Evelyn Ackerman, or the many artists who drew for Little Golden Books. 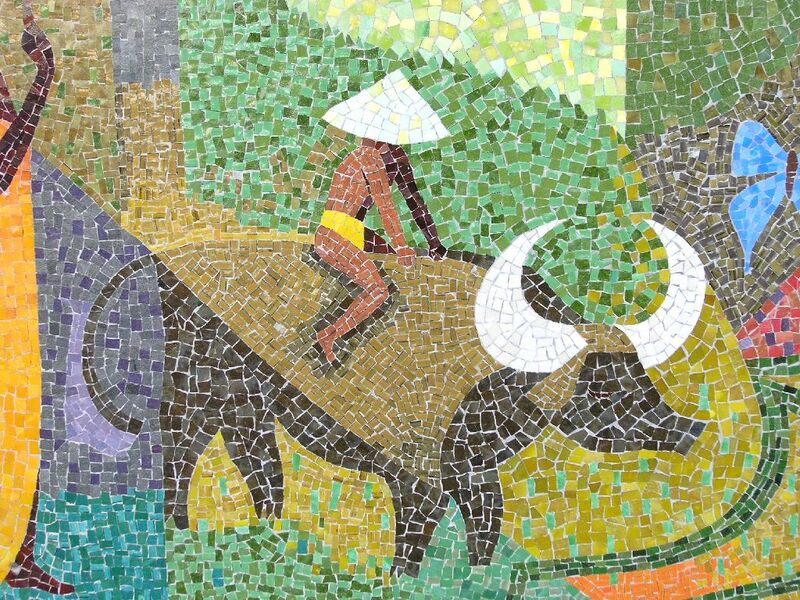 A farmer on a water buffalo in Asia in Macouillard's mural. 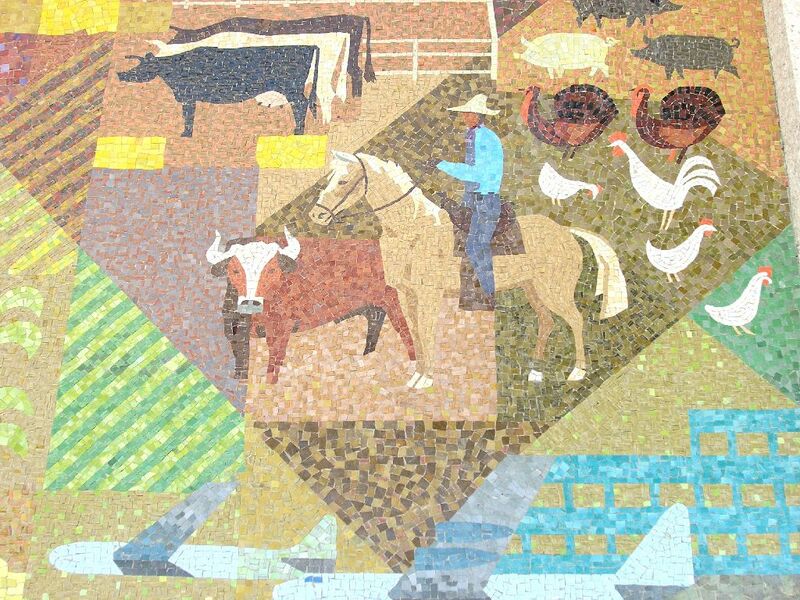 The tile work, done to Macouillard’s design, is by the great Alfonso Pardinas, who created so many of the Bay Area’s top mosaic works. He did work with Beniamino Bufano, for one, and with Eichler’s architects Anshen and Allen, who called on Pardinas for a mural on a doughnut-shaped motel they created near Fisherman’s Wharf. The mural tells the story of A. P. Giannini, founder of Bank of Italy, which morphed into Bank of America. There are scenes of business, farming, transport – and education. There’s a Phoenix – San Francisco rising after the fire and quake. Macouillard (1913-1987) was a San Franciscan who painted landscapes in walercolor, designed two U.S. stamps (one commemorated Daniel Boone), was art director for a poster company, and designed menus for Matson steamship line. While serving in the Pacific with the Navy during the Second World war, Macouillard also created many South Seas scenes, some of which appeared in Life magazine. 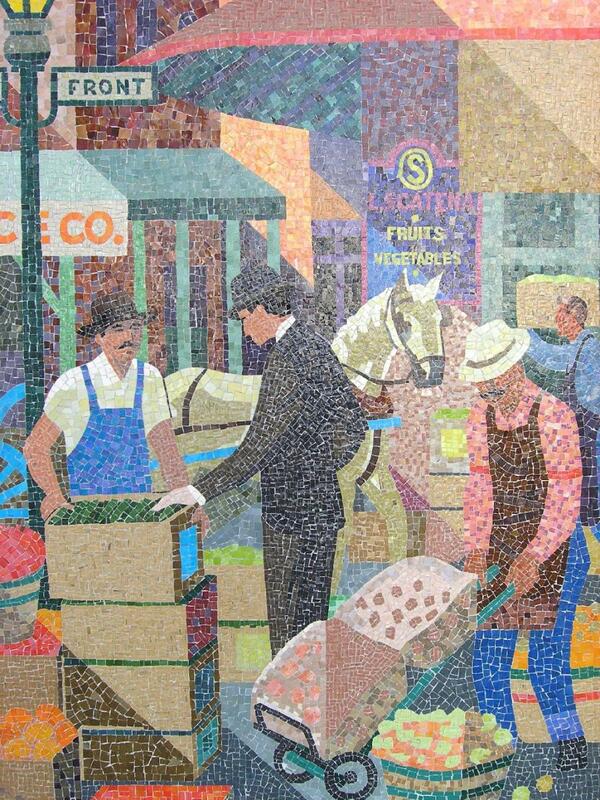 Giannini got his start serving the Italian community in San Francisco, as the mural suggests.